If you’re looking for great inspiration for wedding invitations, than look no further – we’ve rounded up some amazing ideas, as well as the most recent trends in wedding invitations. A monogram with the bride and groom’s initials always has been and always will be a favorite trend for wedding invitations. Why? Because it is modern, elegant and timeless. Besides that, placing the bride and groom’s initials side by side is a symbol of union. Although incorporating color into the wedding invitations is normally a first impulse, going for an all white wedding invitation is a very simple, but chic and modern option as well. 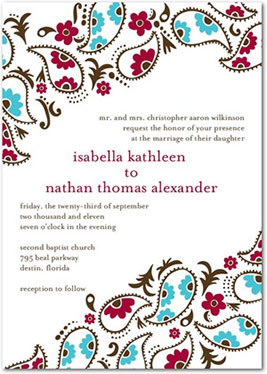 Creating a fabric envelope for the wedding invitation is another very current and original option. 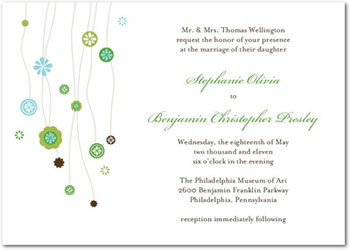 For a Spring wedding and something more casual, opting for fabric envelopes is definitely a trend to consider. The only thing to remember is that when the wedding invitations are mailed, they should be placed in a larger envelope before being sent out. 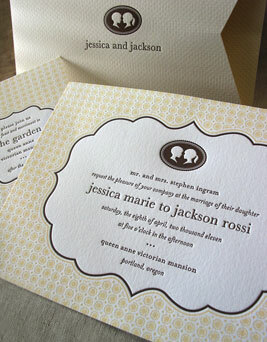 Another great idea is using pieces of the same fabric used to create the envelopes to decorate the actual invitations. Besides being a current trend in wedding invitations, incorporating handwritten lettering in this very special piece of paper is a very elegant and timeless idea, especially for a more exclusive wedding. 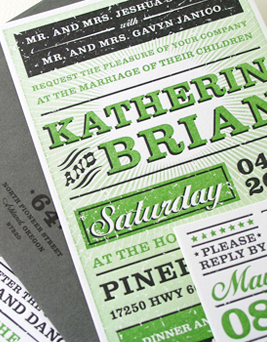 A green wedding calls for eco-friendly wedding invitations. 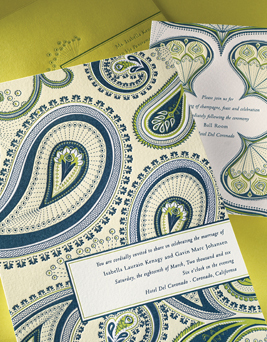 However, an ecological wedding invitation doesn’t mean sacrificing style, it simply implies using something like recycled paper, paper made from 100% cotton or bamboo and using eco-friendly ink – made with soy – to print the wedding invitations. 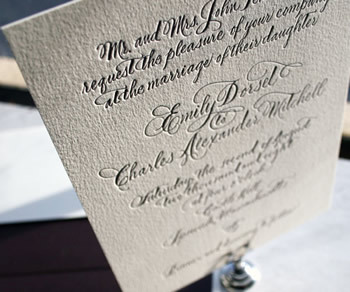 If you can’t find a company that uses eco-friendly ink, there’s always a green alternative: hire a calligrapher to handwrite all the wedding invitations – besides being original, it’s also a very elegant idea. 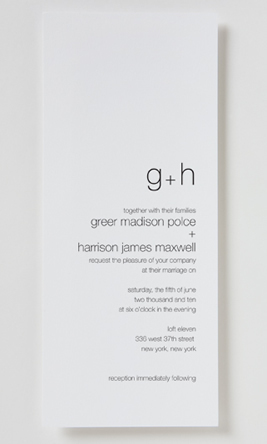 Who would have guessed that this wedding invitation was printed on recycled paper? 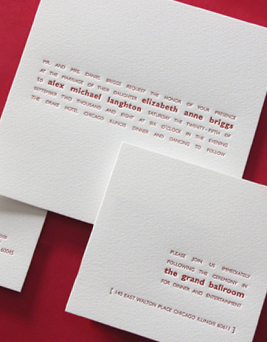 A modern bride and a groom, an urban and original wedding, call for an equally original invitation. In urban weddings, the trends in terms of invitations is to accompany that contemporary style with distinct and standout motifs. Bedazzling wedding invitations with small bright gem stickers, making a band with pearls for the invitations or adorning a monogram with Swarovski crystals are all very fashionable and modern ideas. Weddings have been and always will be associated to the beauty and happiness that only flowers can portray and wedding invitations fit right in with the theme. 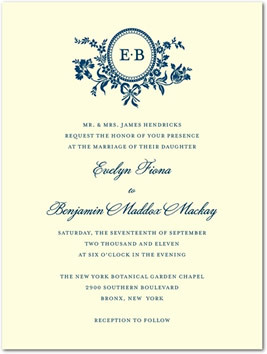 Printing flower motifs on the invitations or choosing a floral stamp for the invitation, envelope, as well as any other wedding detail, is a huge trend. Including the personalities of the bride and groom in the wedding invitation is another spot on trend. With highlights such as “we finally did it”, to pictures of the bride and groom as kids, or a glimpse of what the wedding will be like, as well as funny lettering, just let your comic side shine through!